There is so much information in the market nowadays that it is hard to know where to begin a healthy program. We have put together the basics in our Ultimate Essentials Product Bundle with the intention of giving your cells all the raw materials to re-build and re-generate 100%. At Raw Elements, we firmly believe in Mother Nature, and getting as many plant based products in an easy to use, effective, unheated, unchanged form. Himalayan salt is mined from deep in the Himalayan mountains. This salt contains 82 minerals in their elemental form. Very different from table salt, Himalayan can be used liberally. Liquid Light is cold water extracted from a pristine ancient location in Utah. These minerals are ‘organic’ and easily assimilated by everyone. A fantastic way to get minerals into the system and cells for repair. Greens are another important component of basic health. Most do not get enough high quality veggies in on a daily basis. Besides being tasty, Ormus Greens are raw, dehydrated, and juiced – many formulations on the market today are just grasses ground up. Because we can not digest grasses, Sun Warrior has taken this step seriously and broken down the fiber for easy and complete assimilation. Ormus greens also has very high levels of SOD (Superoxide Dismutase) – a master antioxidant that helps combat stress and aging. Sun Warrior Protein is a raw, easily digested protein that tastes fantastic. Typically proteins made from whey and soy can cause digestive distress and bloating. Sun Warrior has been enzymatically broken down so is easy and healing on the gut. Dandy Blend is made from the root of Dandelions. It is extremely effective in gently cleansing the liver. This powdered product is easily added to water and tastes just like coffee without the bitterness. Our liver is important – so keeping it clean and healthy will assist our bodies with stress and aging. Make daily as you would a ‘coffee’. Can even be blended with coconut oil or ghee as a lactose free version of butter coffee (add Lakanto if you need a sweetness). 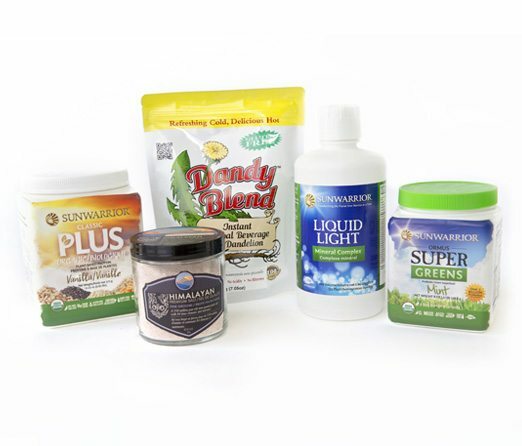 If you are looking to switch to a plant-based diet and don’t know where to start, Raw Elements’ Ultimate Essentials Product Bundle is for you. This collection of products is also ideal for anyone wishing to add more organic, gluten-free and lactose-free staples to their kitchen.